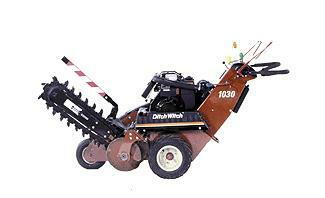 Trencher, Ditch Witch 1030 30"
mm) boom in transport position. rigid frame, chain type trencher. speed and direction controlled with single lever. Belt - two-groove "Power Band"
equipment may not necessarily match that shown. * Please call us for any questions on our trencher ditch witch 1030 30 inch rentals in Eden Prairie Minnesota, Bloomington, Chanhassen, Minnetonka and surrounding Twin Cities communities.